The archaeological site of Delphi. 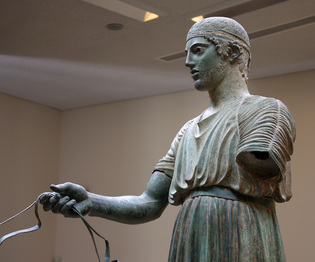 The Charioteer of Delphi, now at the Delphi Archaeological Museum. Located 180 km north of Athens, on Mt. Parnassos, Delphi is the second most important archaeological site of Greece, known in ancient times as the navel of the world. Along the way from Athens, the traveler will see the plain of Beotia, an agricultural center, and will also pass by the city of Thebes, the birthplace of King Oedipus. In ancient times Delphi was considered the place where heaven and earth met so the gods were close-by. 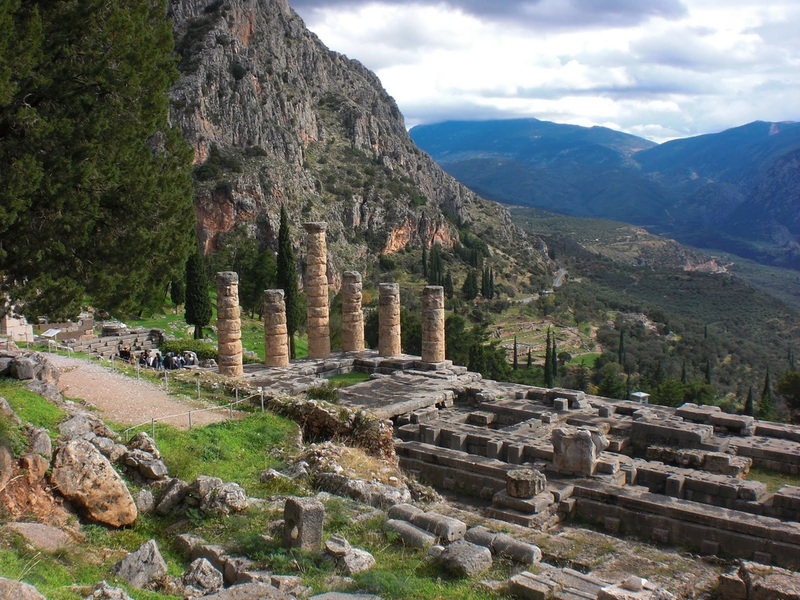 Established around the 7th century BC, Delphi was a sanctuary to the god Apollo. It was here that the Oracle of Delphi was situated, the most trusted oracle in the ancient world from which the spirit of Apollo gave advice on everything from domestic matters to wars. This extensive mountainside archaeological complex contains the remains of the sanctuaries of Apollo and Athena Pronaia, the monument of the Argive Kings, the Treasury of the Athenians, the Athenian Stoa, the Polygonal Wall, the monument of Platea, plus a stadium and a theater. The Delphi Archaeological Museum, housed in a two-floor building with a total surface area of 2,270 sq. m., with fourteen exhibition rooms, storerooms and conservation laboratories for pottery, metal objects and mosaics, was designed by renowned Greek architect Alexandros Tombazis. The museum displays spectacular exhibits found among the ruins, including the frieze of the Treasury of the Sifnians, the Naxian Sphinx, the Statue of Antinoos, the metopes of the Athenian treasury, the famous bronze Charioteer, originally created to commemorate a victory during the 476 B.C. Pythian Games. It's exhibits reflect its religious, political and artistic activities from its early years in the eight century BC to its decline in Late Antiquity. A new lobby, cafeteria and gift shop were created during the museum's latest refurbishment. The circular Tholos at the Sanctuary of Athena Pronaia at Delphi. Depart from Key Tours centrally located terminal for a 10:30 hr one-day trip from Athens to Delphi to explore one of the most famous archaeological sites of Greece. Along the way, you will see the plain of Beotia, and you will also pass by the city of Theva, the birthplace of King Oedipus. The tour will continue towards Mt. Parnassus, making a short rest stop outside the town of Levadia. You will drive then to Delphi, known in ancient times as the navel of the world. Pass by Castalia Spring, visit the archaeological site and view the monument of the Argive Kings, the treasury of the Athenians, the Athenian Stoa, the Polygonal Wall, the monument of Platea and the Temple of Apollo, famous for its oracle and the Delphi Museum, with it's spectacular exhibits that include the frieze of the Treasury of the Sifnians, the Naxian Sphinx, the Statue of Antinoos the metopes of the Athenian treasury, the famous bronze Charioteer, and many other artifacts. 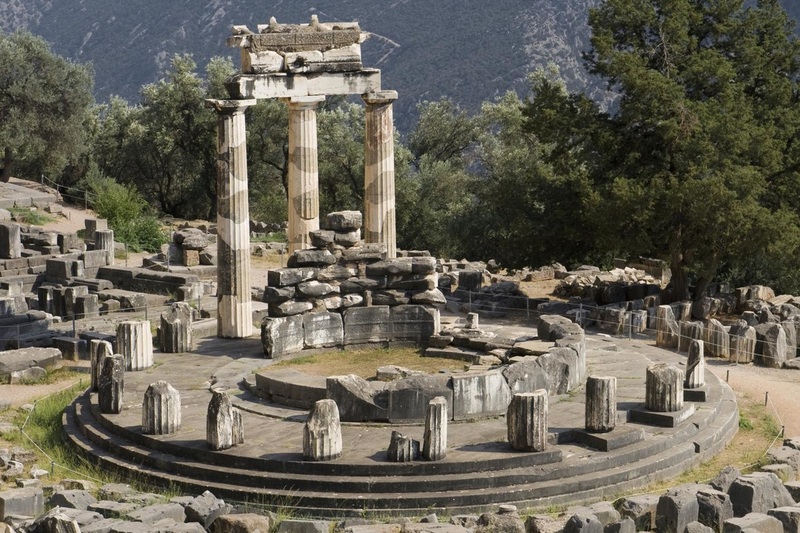 After lunch break, visit Athena Pronaia Sanctuary, the most photographed spot in Delphi. Return to Athens passing by the mountain village of Arachova, built on the south slopes of Parnassus, well-known for its attractive hand-woven carpets, rugs and quilts, as well as for its wine and cheese.